Randy Wadsworth had known for a long time that he wanted to go into business with his old friend Damion “Dame” Moore from his UNC Greensboro Bryan School days. They went all in, leaving behind their corporate gigs to build their first restaurant together. Applying all those business school lessons. “We had a dream and a penny and a lot of sweat equity,” Randy says. They did tons of market research and taste testing before they landed on a favorite from Dame’s time running a catering business: chicken and waffles. 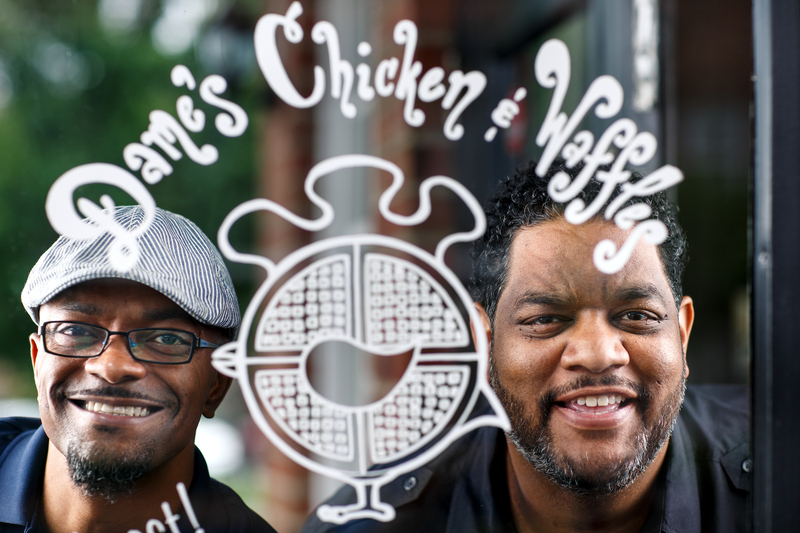 Today, they own four Dame’s Chicken and Waffles locations in downtown Greensboro, Durham, Cary, and the Duke campus featuring comfort food favorites like mac ‘n’ cheese and collard greens – and, of course, their signature dish. They’ve got 10 combinations of fried chicken and crispy Belgian waffles to choose from, each with a different tasty drizzle of sauce and a unique flavored butter. They call those schmears. Dame is working on new dishes as well. “I look at it as a kind of artistic expression in some ways,” Dame says of recipe development. Dame and Randy are also giving back to the community. They’ve created a scholarship fund to help UNC Greensboro students. “It’s our way to give back to the school that got us to where we are,” Randy says. They say that is just part of their commitment, as business leaders, to partner with nonprofits and give back to the city where Randy says he became a man. “Greensboro will always be home. There is still so much growth potential for us in this city,” Randy says.